On Saturday 19th September the Nomads 1st X1 entertained Merlins Bridge in the First Division. A glorious day attracted a sizeable crowd to the Athletic Ground. The ‘Bridge’ always proved a stern test but there was an element of optimism after the success of last season when the Neyland outfit beat the ‘Wizards’ on to occasions. The first period of play reflected an equal share of possession with both sides creating a couple of opportunities to score. However the home crowd had to wait 25 minutes before the deadlock was broken as Mikey Chandler fired home for the Nomads with his right foot. The score remained at 1-0 at the interval and home supporters were anxious that the next goal might decide the outcome of the game. Within 15 minutes of the start of the second half, Wayne Parry connected with the ball in the box to convert the Nomad’s second – and relief that there was now some breathing space. And the final goal came just 5 minutes from the final whistle when Justin Harding ‘fired a rocket’ which deflected off a Bridge defender to make the final score 3-0 to the homesters. 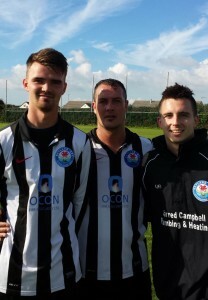 Pictured below are the scorers – from left to right – Mikey Chandler, Wayne Vaughan-Parry and Justin Harding. Team: Patrick Hannon, Scott Jones, Paul Hannon, Nicky Koomen, Sean Hannon, Nathan Warlow, Gary Power, Henry Durrant, Mikey Chandler, Wayne Parry, Justin Harding, Aaron McQuillan, Joe Charlton, Phil Bevan. This entry was posted in Sports on September 25, 2015 by admin.